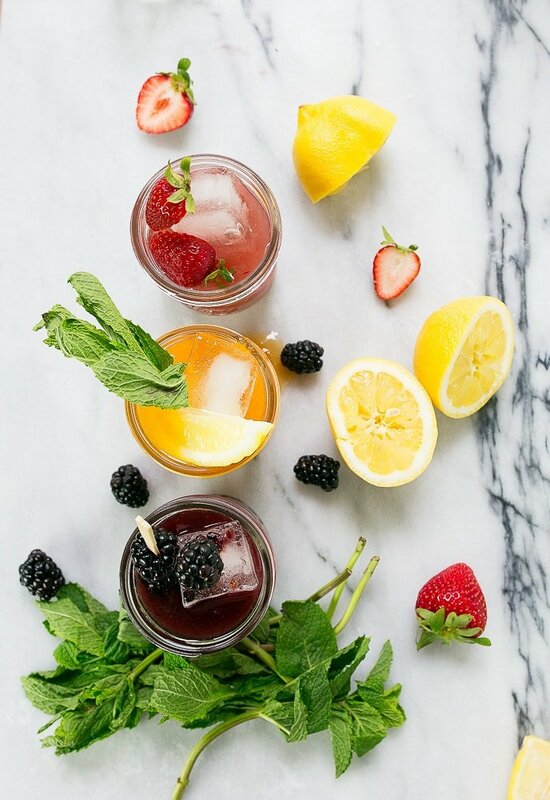 Jam cocktails: also known as a recipe for the happiest cocktail to fuel you all summer long. 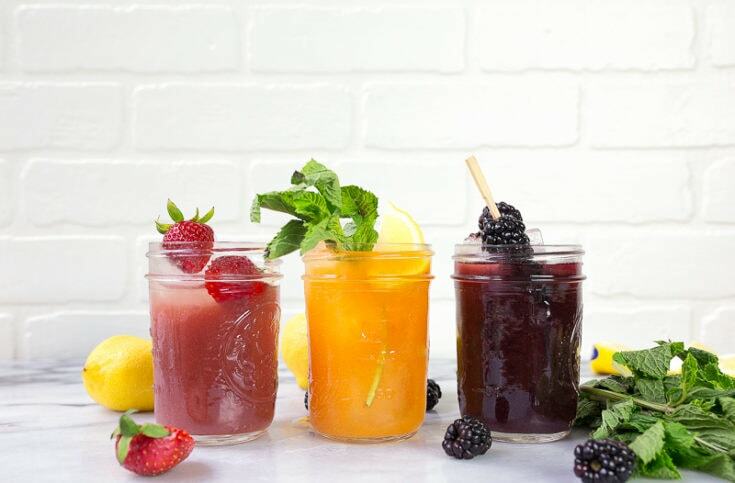 Grab a mason jar, your favorite jam and booze, and get ready to shake! So, we have accumulated quite a few recipes for jam cocktails on this site over the years, haven’t we? I have a whole section on this site dedicated to cocktails made with jam (don’t miss these Fig Jam Rye Whiskey pretty pretty cocktails! ), and I thought it was time to compile them all into one post. It’s time friends: you’re ready to be set free into the world of making your own jam cocktails. I want to inspire you to grab your favorite jam, your favorite booze, and shake up something you like! 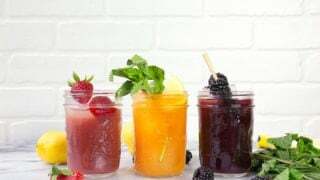 These drinks are completely customizable, and you can make them a different way each time (which is what we do in our house). I remember the first time I had jam in a cocktail. Five years ago (or so), I was in Nashville, and ordered a drink called a peach cobbler. It was shaken with peach jam, and I remember thinking ‘wow! So much easier than simple syrup!’ I’ve been a convert ever since. The benefits of jam over simple syrup in a cocktail are more than just a time-saving step. Jam is sweet like simple syrup, but it has an extra boost of being fruity! Plus, if you use really good jam, it has a thickness to it that makes the best cocktail! Watch me pour the cocktails in this video and you’ll see what I mean. (The video lives at the top of this post in mobile, and on the side of the page on Desktop). In the video, you can see I paired raspberry jam with rum (hi, rum, it’s been a while. did you miss me too? ), apricot jam with vodka (probably my favorite combo), and blackberry jam with gin (I’m a gin girl, always have been & always will be). So, tell me: which jam would you use? And which alcohol would pair it with? 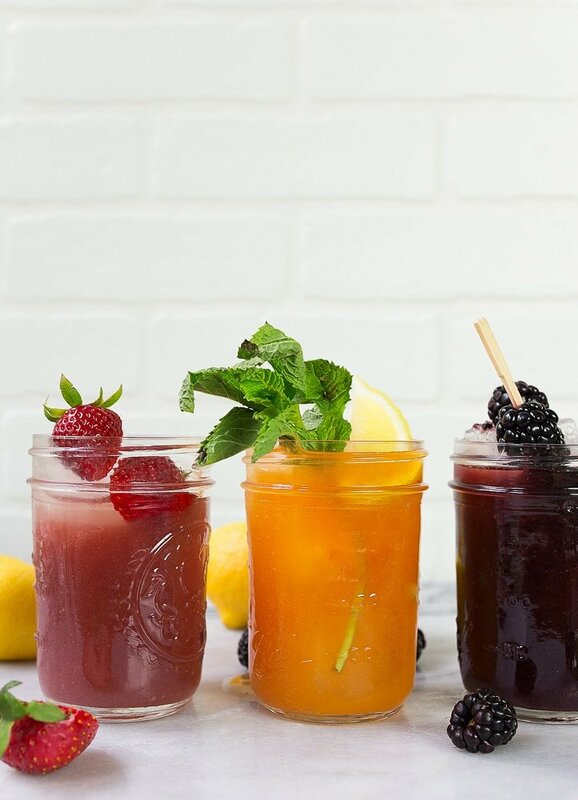 To make each cocktail, combine all of the ingredients in a small 8-ounce mason jar. Shake the jars very VERY well to dissolve the jam. Strain and pour over ice. Serve immediately with garnishes. What about strawberry? The college girl in me loves strawberry margaritas! Or peach. Or pineapple. Or mango. I don’t know why I didn’t think of this before! I love a good strawberry margarita or pineapple & peach too. I love this idea. Thanks for the tip Jenna! this is probably one of my fav recipes here, of course besides your mashed potato truflles. im going to attempt an alcohol free version soon and report back! Trader Joe’s grapefruit marmalade with Hendrick’s gin. I didn’t have lemon so I topped it with lemon seltzer. Refreshing! Hi there! I made your vodka & apricot jam cocktail tonight. It was great! However, can you please tell me your favorite brand of jam? I sprung for a Stonewall Kitchen jam and could not get it to dissolve! Thanks!! And … what kind of strainer are you using?! ??? ?